In an existence which has been purely post-war the Healey has put itself on the motoring map in a position where it is recognised as offering one of the highest all-round performance currently available in production cars. An extensive test which has recently been carried out by The Autocar has enabled a proper appreciation to be obtained of just what nature of performance this remarkable newcomer offers. 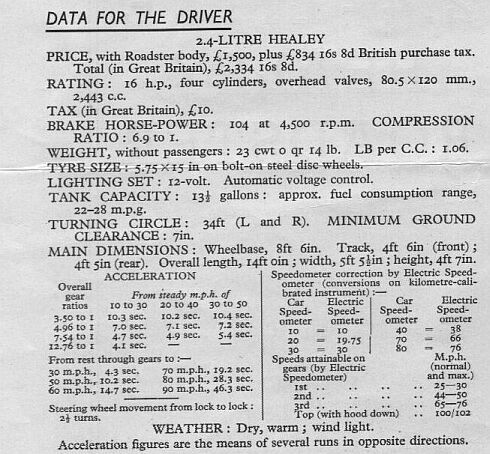 the occasion has been all the more interesting because the car provided for testing was the actual machine with which Donald Healey himself competed in the recent Italian Mille Miglia race, in which it finished ninth in the general classification at nearly 66 m.p.h average, a very fine performance indeed, pointing as clearly as anything possibly can to the merits of the car in high speed endurance. The achievement, it will be remembered, was in addition to that of a saloon model finishing first in the touring classification of the same race. Some ten days after the Roadster's return to England from a trip which, including the race , had totalled some 3,000 miles, The Autocar took it over for testing, and in the meantime it had covered appreciable further mileage. It was understood that, except for repair of a front wing which had been damaged by hitting a dog in the race, the car was in the same trim as in the Mille Miglia and that it had not even had the tappets adjusted. Prepared initially, as one is, for very high performance indeed from this car, one realises within a short space of time that here is a sports car par excellence in modern form. Descendant it is of the true sports car one has known in limited numbers throughout the years, but with the difference as compared with, say fifteen years ago, that the engine is of a type giving more power per litre than was then considered creditable for a sports model, and, above all, with the difference that the suspension is of a soft type, affording real riding comfort as well as the essential lateral stability. 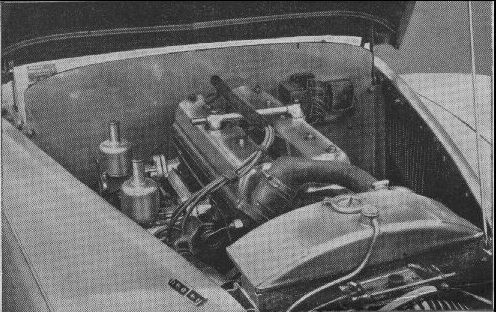 The heart of the Healey car is , of course, the Riley-built 2.4 litre twin high-camshaft overhead-valve four-cylinder engine, and a very fine engine this is for power andreliability under the hardest use. 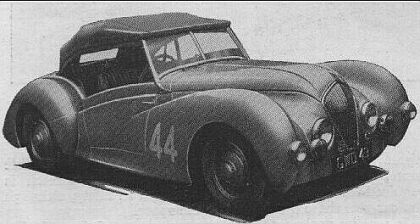 The chassis, of course, is individually Healey, with a rigid but light box section frame and coil spring suspension at front and rear, independent in front, and the car runs on decidedly high gear ratios. Just what the maximum speed of such a car may be is not regarded as being so important within 5 or even 10 m.p.h. as some people would make out, for there are many other qualities of an ultra fast car which assume greater importance. Chief among these are acceleration up to speeds which can frequently be used on British roads, say 80 m.p.h, also the range of speed which is the natural cruising rate of the car, and its general handling. There is none the less a certain satisfaction as well as a certain practical significance in the knowledge that a car will top 100 m.p.h. given suitable conditions, the practical significance being that at such speeds as 80-90, normally to be regarded as very fast such a car still possesses a definite margin of reserve. 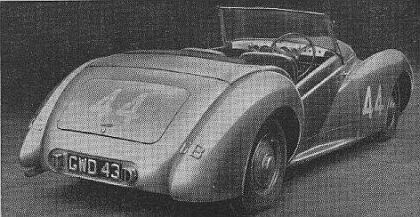 The testing carried out by The Autocar has enabled the maximum of this particular Roadster in open form to be put down as between 100 and 102 m.p.h on level ground. The makers state that it is some 4 m.p.h. faster with the hood erected, which may well be credited, as in turn the saloon model is faster still. Data-recording conditions on this occasion were not helped by the fitting of a kilometre-calibrated speedometer for purposes of the Italian race, the needle of which was not regular in behaviour and prevented a proper check of its readings being made at some speeds. A top reading of 4,500 r.p.m. on the revcounter was seen on top gear, and thus as 1,000 r.p.m. corresponds almost exactly to 24 m.p.h., theoretically this should represent 108 m.p.h., but various factors enter into the matter at very high speeds. The next outstanding question with such a car concerns the average speeds which can be achieved with it. In this country, of course, traffic has a considerable influence, and the Healey had the benefit of the last few days of roads abnormally clear by reason of the private motoring ban and, therefore, more nearly corresponding on certain routes to Continental conditions than are likely, one hopes, to be seen again in this country. It is perhaps sufficient indication in this direction to record that in one particular hour during the test the Healey recorded 58 miles without touching maximum speed. There is no cruising speed which can be specially assigned to it, for much more than most cars even high-performance examples, it can be driven in its high ratio, exceptional today in being in the "three -point-something" category, as fast as the road permits and the driver chooses, without feeling stressed mechanically. The average stretch of road available in England is just not sufficient to let this car right out to full maximum; 80 is seen with consummate ease and 90, approximately 4,000 r.p.m., becomes almost a commonplace on a favourable route, but obviously a somewhat exceptional stretch is required for the magic hundred and over in safety, although the car gets there quickly given the space. It will be noticed that an unusual range of through the gears acceleration figures has been recorded and it is very striking commentary on the performance that 90 m.p.h. can be reached form rest in a mean time of 46.3 seconds. When accelerating for test purposes in this style it is possible to make the rear tyres leave long black power marks from wheelspin on a dry surface during the getaway on a wide throttle opening. Results such as these are obtained without appearing to stress the car unduly. With a light alloy body the power to weight ratio is exceptional, the car carrying in full running trim as tested, only fractionally more that 1 lb per c.c. of engine size. All told, it will be realised that, as expected, the performance is tremendous. Few cars could live with the Healey on a journey if its driver were trying, and it hardly needs to be said that gradients scarcely exist for it. Main road slopes present opportunities for accelerating safely into the eighties. A more considerable slope may bring the pace down to a point where, for amusement value, it may be worth using third which offers a genuine 76 m.p.h. maximum. Steeper stuff such as the 1 in 6 1/2 hill often used in these tests gives the opportunity for almost a Shelsley-type climb, bringing in a second on which 50 m.p.h. is obtained within a 5,000 r.p.m. limit. Showing the seating and instruments. 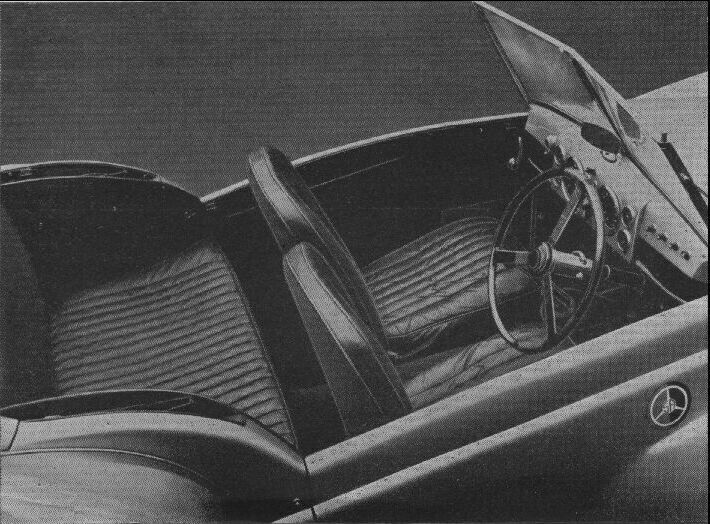 The telescopically adjustable spring-spoked steering wheel is taped to suit Mr. Healey's personal ideas in a long distance event. The switch seen on the left of the facia board is for an additional horn fitted for the race. The angle of the front seat back rests can easily be adjusted. A useful "grab" rail, which has a structural usefulness, extends across the passenger compartment. Although the rear seat is comfortably upholstered and has foot wells, it will be seen that it is of strictly "occasional" nature. Is is chiefly useful as luggage space, for the rear locker houses the spare wheel, side screens, tools and twin petrol pumps. The Healey roadster from various viewpoints, and still carrying its Italian Mille Miglia race numbers and the B.A.R.C. and B.R.D.C. badges fitted by Mr Donald Healey, who drove this car in the race. This car attains a thoroughly modern and aerodynamically efficient shape, the test of which aesthetically is that it is readily acceptable, even by a motorist who inclines towards a "diehard" outlook over car appearance, besides which this Healey looks "right" from any angle, including the view over the bonnet from the driving seat. Perhaps, however, here the dead front view is most pleasing. This car is seen also to be still sightly with the hood up. If the picture has been given of a 100m.p.h. maximum car which achieves its performance without fuss, without noise which in itself would cause the passer-by to look round, and of a car which can achieve quite startling point-to-point averages, then sufficient has probably been said about the sheer performance aspect. Not so much expected are the tractability and flexibility of the car, its near silence, and its comfort. 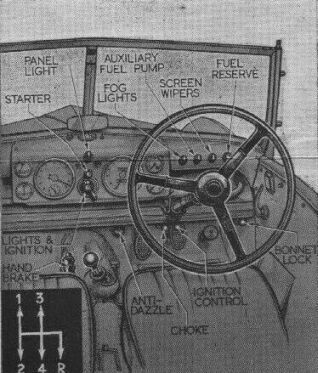 It will potter through a town on the high top gear, and can even be made to pull round a right angle corner on top gear, although some pinking on the present pool petrol when pulling away unless the pull-and-push ignition control mounted near the steering column is retarded. On going into a speed limit one throttles back from high speed and runs through the area without noise or ostentation. In traffic, third and second suffice except for actual starting and both gears are virtually dead silent. There is some exhaust note on accelerating hard, but not of a strident kind that booms in the ears. As to comfort, the car is again a surprise. It is quite softly sprung, with considerable amplitude of spring movement, and poor surfaces are scarcely noticed, yet ate the same time one can do with this car on corners just what one wishes to do with a fast car. As so often applies to modern fast cars with i.f.s, there is little guidance in the feel of the car as to the correct and safe speed for open bends, but at all events there is some suggestion of the tail tending to slide first with an excess of zeal, which is as one prefers. The steering - which i snot of rack and pinion type, as on a number of modern cars - gives accurate handling at speed on the straight and for placing the car in corners. It has strong castor angle and is quite high geared, it is on the heavy side for low speed turning and manoeuvring. 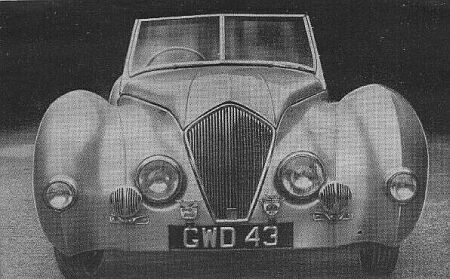 The Lockheed hydraulic brakes are given a big job of work to cope with on such a car as this, and they cope satisfactorily. The short remote-control gear lever is admirably placed, but the handbrake lever, to the left of it, could be within easier reach. It is effective, however. The gear change is a delight to use, with excellent syncromesh on second, third and top. The clutch action is smooth for starting and there is adequate room for the left foot beside the pedal. 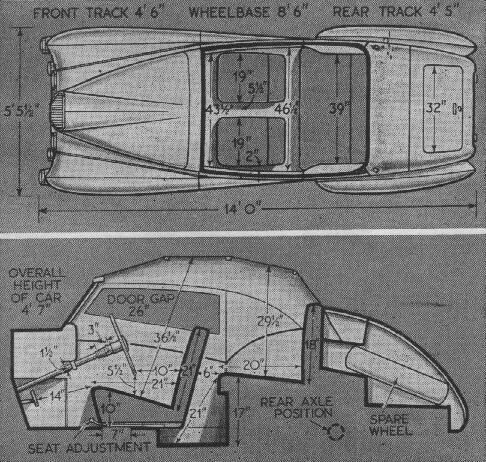 One obtains a first rate driving position, and driving vision is capital, with a full view of both wings - a most desirable attribute of such a machine. Engine view when the one piece bonnet is lifted; it is released by a remote control inside the bonnet and guarded against unwanted opening by a robust safety catch. Twin S.U. carburettors without air cleaners will be noticed, also the radiator filler and steam protected vent pipe. The sparking plugs are accessible between the valve gear covers and the oil filler is convenient on the left side. The concealed hood is quite easily attached and removed. Points of detail have been considered in the provision of a shelf for oddments under the instrument board and roomy compartments with flap lids in the thickness of the wide but light doors. The instruments include an engine water thermometer. A reserve petrol supply is obtained simply by pressing a switch on the instrument board, when an auxiliary electric fuel pump comes into operation, together with a reminder light on the instrument board; the auxiliary pump is also available fro sustained Alpine climbing. Instant starting from cold was obtained with very brief use of the choke. A good light for medium speeds is given by the built-in fog lamps, which incorporate parking bulbs, and the main head lamp beam is adequate for speeds in the eighties. For such a car the horn note could certainly be stronger. The oil consumption was very low under conditions of sustained hard driving.